Live theatre enthusiasts and fun lovers gathered last Sunday for the 8th edition of Steve Onu Yaw’s annual stage performance tagged: Shalanga (Pit or Latrine) starring Ayo Makun, the ace comedian. The duo of Yaw and AY had never performed together on stage, but last Sunday many were surprised to see the acting talents of these entertainers. Held at the prestigious Eko Hotel and Suites, Victoria Island Lagos, the event was not just about drama but also an evening of music and comedy. Entertainers like De Don, Bow Joint, Funnybone , Babakay, Immaculate, Momica Ogah and others electrified the audience with their performances. The play, Shalanga, chronicles the murky side of being a Nigerian. In the drama, Yaw starred as a newspaper vendor, while AY played the character of an unemployed graduate struggling for survival. Allusions were made to the #145 fuel pump price , President Buhari’s visits to 22 countries, Omawunmi walking out on a journalist , Tiwa Savage’s marriage crisis and other contemporary issues. The highpoints of the show After the play, the second half of the show was dedicated to musical and comedic performances. A-list entertainers like Olamide, Ycee, Patoranking, Adekunle Gold , Reminisce, Solidstar, Senator, Burna Boy , Vector and others took the audience on a journey of remarkable entertainment . The return of the dancehall kings One of the highpoints of that night was when Baba Fryo and Marvellous Benjy mounted the stage. They took turns to perform their hit songs, Denge Pose and Suo. The audience erupted in excitement and some people had to stand on their chairs in order to have a clear glimpse of the dancehall stars. Even Don Jazzy couldn’t resist their magical performance. He stood up, showing off his Galala dance steps. Kenny Blaq’s stunt Budding comedian, Kenny Blaq pulled a stunt on the audience when he did a medley of some popular Nigerian songs in a humour. This got the audience reeling with laughter. He got a standing ovation after his performance. 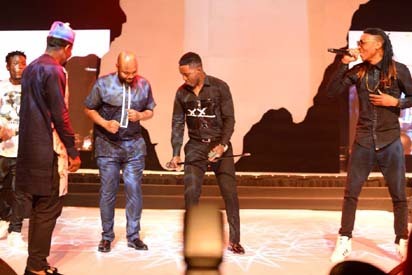 Olamide shows his benevolent side Not to be outdone by other artistes, Olamide and Phyno ended the show on a bright note with their pulsating delivery and charisma. Olamide who is known to be spontaneous, midway into his performance left the stage and went into the crowd to connect with the audience. He stood on the extension of the hall and got the crowd cheering and begging him not to leave them . It was a remarkable night of live theatre, music and surprises. Though the event didn’t start at the specified time, everyone who attended left feeling like rock stars who had partied all night.